Move into the 21st century and pick up a CSI XR-5 Advanced Main Battle Rifle. The XR-5 is unlike any other rifle currently on the market today. Built around the traditionally durable version 2 gearbox, the XR-5s relation to the M4 ends there. The XR-5 features a futuristic injection molded polymer body, molded with the ergonomics of the user in mind. The fire controls are similar to the favored M4 rifle ensuring that there is little learning curve when transition from your old battle rifle to the XR-5 Advanced Main Battle Rifle. To top it off the XR-5 features top, bottom and side accessory rails for mounting all 20mm accessories such as vetrical grips, weapon lights or grenade launchers. Magazine Capacity: 200 rd Hi-Capacity. 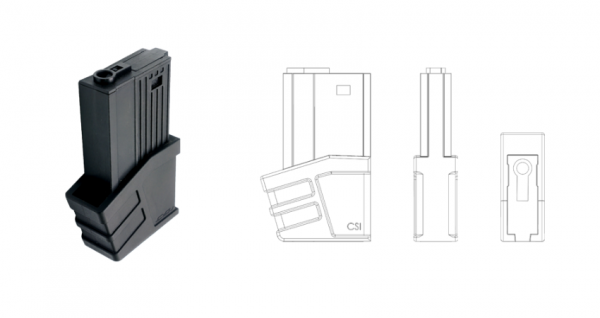 Works with other compatible M4 / M16 Series Airsoft AEG Magazines.